When it comes to finding a perfect pair of jeans, there are a plethora of factors to consider, fit being number one. Fortunately, the editors at Elle did all the legwork in a recent denim guide where five women tried on different jeans, all in the name of finding the one that would reign supreme for the group. The winner was a classic brand in a quintessential style: Levi's Wedgie Fit Jeans ($90). Most of the Elle staffers agreed that this particular pair of jeans flatters the backside, while its sturdy fabrication, combined with the cut, suited all shapes. "The jeans created a flattering, flattening effect at the front and gave the illusion of a more hourglass-like waist. They're muffin top eliminators!" said Kristina. Nikki raved on, adding "Levi's Wedgie Jeans are a fashion editor's dream. The cut gives you a peach booty (so you look good when you walk away), in addition to slimming thighs and hips." Amazing fit aside, one editor pointed how they made her feel, which pretty much sold us on the style. "When I compare this picture to those of the other jeans, they might not have been the most flattering pair, but I liked them and felt confident in them," said Natalie. Be sure to read the rest of Elle's fall denim guide for even more incredible styles. 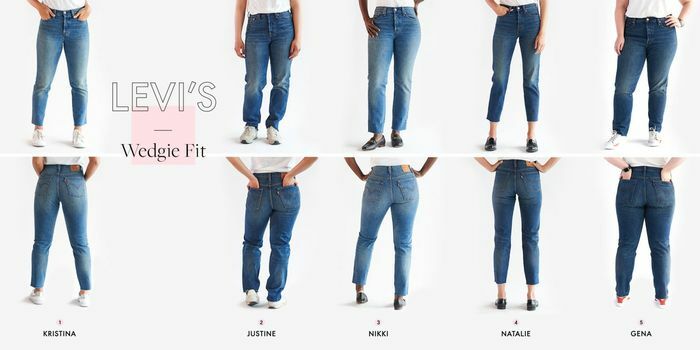 Check out the fit of these Levi's on five different women below and keep scrolling to shop the editor-approved style. What jeans do you think are the most flattering? Tell us in the comments!